Anyone can become an expressive artist and musician. This includes you. Artistic greatness (in any form) doesn't require natural talent. Having something to say (that you want to express artistically). This includes your life experiences, thoughts and emotions (more on this below). Having freedom to express yourself fully through your artistic medium of choice. (The artistic medium for you is your guitar). "Sounds great, but how do I do this?" Answer: There are 5 common reasons why musicians (especially most guitar players) do not develop into truly expressive artists. Most musicians are not aware of these reasons and do nothing to try to overcome them. They instead blame their lack of results on perceived lack of natural talent. A great guitar teacher helps you identify which reasons are holding you back from becoming a true artist and guides you through the process of reaching your goals most quickly. 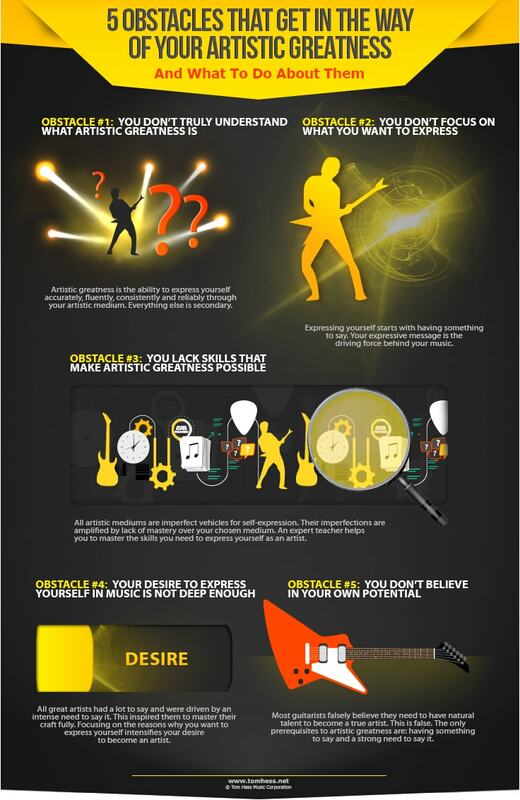 Avoiding these common obstacles makes musical greatness a lot easier to achieve. Most musicians don’t truly know what artistic greatness is. It’s impossible to pursue something you cannot even define. Artistic greatness is the ability to express yourself accurately, fluently, consistently and reliably through your artistic medium. Everything else is secondary. Expressing yourself starts with having something to say. Your expressive message is the driving force behind your music. Sometimes the message might be intentionally obscured, other times it is crystal clear. Great artists such as: Beethoven, Bach, Chopin, Wagner, Michelangelo, Renoir, Delacroix, Picasso, Goethe and Shakespeare all had a lot to say. It is the one thing that enabled all their other talents, skills and knowledge to bloom. They mastered their art (medium) to express themselves fully and completely (more on this below). Everyone has something to say, but some people have a lot more to say (express) than others. Certain life experiences, thoughts, and emotions may simply be more vivid and intense for some people than they are for others. Learn how to eliminate musical frustration as a guitar player. you into a better guitar player. all of your guitar playing goals. Ear training - your ears transform the sounds in your head into specific notes you play on guitar. This allows you to express what you want to hear. Understanding of music theory. Music theory teaches you to explain and predict musical emotion. This helps you express what you want much more easily and accurately. Lack of fretboard knowledge (visualization). This goes much deeper than knowing the notes on the guitar neck. Fretboard visualization is your ability to visualize scales, arpeggios and chords in every area of the guitar, in any key. Note: you do not need to master everything about guitar or music to achieve artistic greatness. You only need enough skills to express what you want to express. Wasting time developing skills you don’t need is just as bad as lacking musical skills you do need. This often leads to musical frustration. All great artists had a lot to say and were driven by an intense need to say it. This inspired them to master their craft to express themselves fully. Many musicians don’t have a strong enough desire to express themselves and develop their musical skills. This is a key reason why people with a lot of potential for musical greatness never achieve it. Most guitarists falsely believe they need to have natural talent to become a true artist. They think that musical masters were born with some special skills not available to them. This is false. The only prerequisites to artistic greatness are: having something to say and a strong need to say it. This is the only thing great artists had in common when they started. They had to work hard to develop the skills needed to express the art inside them. Finding something to say starts with digging deep inside your life memories, pains, loves, fears and moments of personal triumph. This critical piece is completely within your control. Acquiring and mastering the skills you need to reach artistic greatness is the easy part. Seek out a great guitar teacher who has helped many other musicians to become great and study with him/her to reach your musical goals.